$8.704 million on 3328 screens. 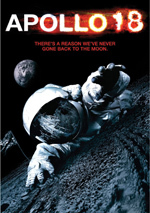 For another entry in the “found footage” genre popularized by flicks like The Blair Witch Project and Cloverfield, we head to 2011’s Apollo 18. According to official sources, late 1972’s Apollo 17 was the last mission under that umbrella – and the final time man landed on the moon. According to this movie, however, NASA sent up Apollo 18 in December 1974 and took three astronauts back to the Moon on a secret mission. Lt. Col. John Grey (Ryan Robbins) remained in orbit on the main aircraft while Commander Nathan Walker (Lloyd Owen) and Captain Benjamin Anderson (Warren Christie) worked on the Moon’s surface. While up there, odd events start to occur. Walker and Anderson discover a dead cosmonaut, a surprise since they thought the Soviets never made it to the Moon. After that, the US flag they planted disappears, and other weirdness follows. Tensions build and we eventually learn why man hasn’t returned to the Moon. Based on its trailers, I thought Apollo 18 looked like it would be a creepy winner. When done well, the “found footage” flicks can be entertaining and effective; I really liked Cloverfield and thought Blair Witch was pretty solid as well. I skipped 18 on the big screen because I worried all its “shakycam” would cause motion sickness, but I was eager to see it on DVD. Unfortunately, it doesn’t live up to expectations, and it doesn’t stand with the better “found footage” efforts. Instead of matching up with good flicks like Cloverfield and Blair Witch, 18 follows the Paranormal Activity template and delivers a whole lotta nothing. Like that 2009 snoozer, I can’t say that literally nothing happens here, but it sure feels that way. Actually, more develops in 18 than in the nearly action-free Activity, but the movie’s events never do much to raise much interest in the viewer. We expect action and drama but just get attempts at creepy atmosphere and cheap scares. Part of the problem stems from the choice to ladle out spooky atmosphere from start to finish. Rather than allow tensions to escalate, the movie launches with a sense of foreboding and dread and has nowhere to go from there. Why not let the events develop in a more natural way? Yeah, I know we’ve seen the trailer and expect matters to turn bad eventually, but the attempts to put us on edge from virtually minute one don’t work. They do much more to negate potential scares and drama than to embellish them. The film also never seems vaguely real. That’s a fatal flaw with this sort of movie; if we don’t buy into the notion that we’re watching something that actually happened, we don’t buy into the movie. On an intellectual basis, we all know Apollo 18 - and Cloverfield, and Paranormal Activity, etc. – are fictional efforts created by filmmakers, but when done right, the genre allows us to suspend disbelief and feel like we might be watching real events. That never occurs during Apollo 18. The whole thing comes across as contrived and fake. The actors never make you believe they’re real astronauts, and the footage tends to look like the modern material mucked up to seem old. There’s a basic lack of verisimilitude that robs the film of any potential realism. Not that it’d be interesting even if it didn’t seem so artificial. As mentioned, the story progresses slowly and comes with precious little payoff. This is a plodding tale that seems to last much longer than its brief running time. Speaking of which, the movie’s length almost feels like the filmmakers’ concession that they don’t have much meat in this particular sandwich. While billed as an 86-minute flick – already quite short - Apollo 18 really clocks in at 75 minutes minus credits. It’s not the shortest modern feature film I’ve seen – the 70-minute-before-credits Master of Disguise probably wins that title – but it’s still awfully brief for a picture that made it to the big screen. Given the dull material seen on that screen, perhaps I should be happy that I got to move on with my life once those 75 minutes ended. Apollo 18 boasts a premise chock full of cinematic potential, but it squanders it. It ends up as a dull dog with nary an interesting moment to be found. 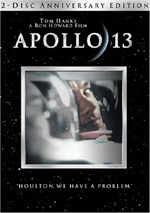 Apollo 18 appears in an aspect ratio of 1.78:1 on this single-sided, double-layered DVD; the image has been enhanced for 16X9 televisions. Actually, I should say that the film sometimes appears in an aspect ratio of 1.78:1, as it uses a variety of frame sizes. Most of the film looks like it’s about 1.50:1; some shots narrow to 1.33:1, while others do broaden to 1.78:1, but much of the flick resides in between those ratios. Why does it vary ratios so much? I have no idea. I suspect it’s to communicate changes in cameras; since the alleged “found footage” is supposed to come from a mix of sources, the varying ratios allows them to show some differentiation. None of it makes any sense, though; I think the original material would’ve been 1.33:1, so the flick should’ve either gone with that the whole time or simply cropped everything to 1.78:1. The constant ratio changes become an unnecessary distraction. I found it awfully tough to rate the image of Apollo 18 because in an objective sense, it looked terrible. Of course, it was supposed to look bad, as it was meant to come from decades-old material shot under poor circumstances. Plenty of footage was intentionally soft and fuzzy, and we saw dull colors, flat blacks and muddy shadows. We also saw lots of specks, marks, debris and scratches put onto the footage to create the illusion of old, neglected film. All of these made the movie ugly to watch on a consistent basis, but that’s how it was intended to appear. The DVD seemed to replicate the source material in a pretty accurate manner, one that I’d find it hard to think Blu-ray would improve. After all, if the movie’s supposed to be messy and soft, how would a higher-resolution format make it better? However, I think that most readers expect an “A” picture mark to represent something that looks great in an objective sense. If I give a flick like Apollo 18 an “A”, many may be disappointed to see what an ugly mess it actually is. This is an inherent flaw in something like the letter grades, but I feel the “C” for Apollo 18 is a reasonable compromise. Objectively, the flick looks terrible, but the DVD replicates it in an appropriate manner. I don’t need to be as subjective with the generally good Dolby Digital 5.1 soundtrack of Apollo 18, though I’m always annoyed by “found footage” movies that offer multichannel audio. Logically the material should’ve remained essentially monaural since it’s supposed to come from the source cameras. Indeed, much of it should be silent, as I’d suspect that footage shot in the way depicted here would lack audio. However, as was the case with many other flicks in the genre, the filmmakers decided to take moderate auditory liberties and open up the soundfield. Most of the audio focused on general ambience and added a layer of creepiness throughout the film. Some action sequences brought out more prominent sounds; in particular, the mission’s launch and some other spacecraft-related bits opened up the track. Still, the emphasis remained on tension along with the occasional jolt. Audio quality seemed good. Speech was natural and concise, and effects showed solid range. Again, the launch had a lot of oomph behind it, and the other louder bits boasted nice dimensionality. Though this wasn’t a killer mix, it was pretty good. When we move to extras, we open with an audio commentary from director Gonzalo Lopez-Gallego and editor Patrick Lussier. Both sit together for this running, screen-specific look at story/editing choices, camerawork and visual issues, archival footage and attempts at realism, effects and technical considerations, cast and performances, sets and effects, and other challenges. Though packed with more praise than I’d like, Lopez-Gallego and Lussier still manage to cover the film well. As expected, they concentrate on technical areas, but they give us a broad enough discussion to keep our interest. While the track can be a bit bogged down by happy talk, it works pretty well as a production overview. 16 Deleted and Alternate Scenes fill a total of 20 minutes, 26 seconds. Given that the final film’s so dull, I doubted we’d get anything interesting here, and I was mostly correct. We find minor additions to training and a few more character beats, but little that delivers useful material. A scene of one astronaut’s debriefing is the only moderately compelling piece in this collection. We also find four Alternate Endings. These occupy a total of four minutes, 42 seconds and show different ways of killing the same character. None of them seem particularly interesting. The disc opens with ads for Scream 4 and The Zombie Diaries 2: World of the Dead. No trailer for Apollo 18 shows up here. Although I hoped to find a tight, scary “found footage” effort in Apollo 18, instead I got a slow, silly film that lacked the believability required for the genre. Only its basic concept seems interesting; everything else about the movie flops. The DVD comes with appropriate visuals, lively audio and a few useful supplements. Apollo 18 ends up as a boring disappointment.